Pink Pewter Lamium has a beautiful display of silvery leaves with dark green edges. The salmon-pink blooms begin in mid spring and will bloom off and on until early fall. It will grow to a height of 6" to 8" and 12" to 24" wide. Pink Pewter Lamium will do best in partial shade to full shade in moist, well drained soil. 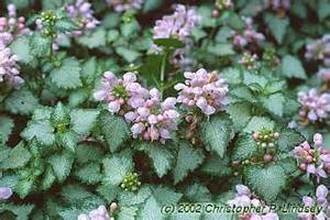 Plant Pink Pewter Lamium as a fast growing ground cover in a Woodland Garden, Cottage Garden, trailing over walls, or draping from hanging baskets and containers. Pink Pewter Lamium is also deer resistant and will become drought tolerant once it is established. Pink Pewter Lamium looks great planted around Hostas, Ferns, and other shade loving plants.